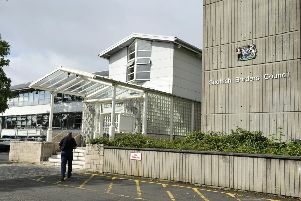 As expected, Scottish Borders Council (SBC) has today (Thursday) approved the administration’s budget plans. However, a bid by the opposition group, headed by Michelle Ballantyne, to scupper the building of the centre which would host the Great Tapestry of Scotland, was beaten by 21 votes to 10. The agreed revenue budget will spend £263million on council services in 2016/17 and £1.3billion over the next five years. Despite financial pressures, £304million has been allocated to the 10-year capital programme, representing investment in new schools, flood defences, sports facilities, visitor attractions, energy efficiency measures and transport infrastructure. Commenting on the budget plans, Council leader, Councillor David Parker, said: “In the face of continued financial challenges, we have put together a budget which protects frontline services but still invests in a number of key areas. “This is thanks to the careful long-term planning approach we take with our budget setting process, meaning we are in a far better position than a number of other councils which are having to make significant cuts to key services, which we are not. “In fact, the proposals that have been agreed today show we are taking a pragmatic approach towards our budget. An amendment to the proposed budget, moved by Councillor Parker and subsequently approved at the budget meeting, will increase roads spending by £500,000 per year, a 14% increase on the current revenue budget. This represents an additional £2.5million investment over the five years of the budget plan. As well as an increased investment in roads, the budget included £400,000 of additional funding earmarked to bring forward the final design stages of the Hawick Flood Protection scheme by one year, which has the potential to deliver the whole project up to six months earlier than anticipated. Councillor Parker added: “In terms of the additional capital resource for the Hawick Flood Protection Scheme, the council has now done everything possible to advance the scheme ahead of full scale construction. “The council is currently developing the outline design phase for the scheme and consultation is also under way with statutory bodies and the community. The Council reassured parents of children with the most complex needs that their support from Additional Support Needs (ASN) provision will not be reduced, but in fact enhanced as part of a long overdue review of the service which will allow the council to change historical practices. The ASN service has always had one of the best ratio of Additional Need Assistants (ANAs) per pupils compared to other areas and will continue to do so. The council will look to deploy ANAs more effectively to meet children’s needs through targeted and flexible support for children across the Borders. The plans will also implement increased training for pupil support staff in various specialisms. This training, as well as the council creating a range of new level posts with an increased range and depth of skills, will allow SBC to offer greater support to our children with more complex needs. Passing on £5.3m to be paid via the NHS budget to the new Health and Social Care Partnership established on the 1 April 2016. Councillor John Mitchell, depute leader (with responsibility for finance), added: “We are all aware of the pressures on public funding, which means SBC has to tackle a potential funding gap of £29million over five years. “Yet, with the help of public consultation – including our online Dialogue tool – and a series of plans in our Corporate Transformation programme, we are looking at ways of doing things differently to make the significant savings required. Councillor Catriona Bhatia, Depute Leader (with responsibility for the Health Service), said: “An enormous amount of work has gone into this budget from elected members and officers at the council in difficult circumstances. “It invests in a number of vital matters, including £5.3m passed to NHS Borders for the new Health and Social Care Partnership, which aims to expand services and join up services more effectively. “In addition, the budget includes funding of facilities for children with additional and complex needs at the new Duns and Langlee primaries and early years provision at the new Broomlands Primary. Roads and bridges and energy efficient lighting investment – £6.8m. Flood Protection – -Selkirk (final phase) £9.4m; Hawick (initial design phase) £3.2m; General flood prevention 0.7m. Waste Management including Langlee Transfer Station – £7.0m. Other land and property including energy efficiency – £2.7m.